I promised my basketball girls I’d make them cookies. Since they do happen to be thirteen year old girls, I didn’t think a compost cookie or a meringue would cut it. So, I decided it would be the perfect opportunity to try out Thomas Keller’s chocolate chip cookies. The standing deal with my brother and I of me offering to exchange chocolate chip cookies for dishes with my brother had absolutely everything nothing to do with my decision. There’s a couple of interesting parts to the recipe. You may notice that there’s a lack of vanilla. Don’t be skeptical- it’s Thomas Keller. He knows what he’s doing. Also, you cream the butter in two stages. I’m not quite sure what it does, but I’m betting that it helps the cookie get mixed better. Last note: this is not the exact recipe you see in Ad Hoc at Home. It’s streamlined and in volumetric measurements rather than weights. This one doesn’t have you strain out the chocolate powder from the chopped chocolate, which is easier, less time consuming, and creates less dishes. I happen to like as much chocolate as possible, so this works for me; you can strain out the chocolate powder if you like, though. I cheated a bit and used semi sweet chocolate chips instead of hand-chopped chunks. I find that chopping chocolate is a lot more therapeutic now than it was before when I first made Joanne Chang’s cookies, but I’m still not willing to devote half an hour to create perfect shavings of chocolate. So I compromised, and chopped up my 72% and used chocolate chips for the other portion of chocolate. I used a 1 1/2 T scoop rather than a 2 T scoop, and made 44 cookies. If you made 1 1/2 T sized cookies with all the dough, you’ll probably make more. A shocking amount of cookie dough was transported to a certain person’s tummy because she was the only one at home. Ooops. I originally set the timer for 8 minutes, since it’s proportionate to the size of the cookies. However, the cookies needed an extra two minutes, since the middles were still raw at the eight minute mark. The cookies were pretty amazing. They are basically Joanne Chang’s cookies, but less time consuming. The ribbons of chocolate running through the buttery cookie were just bitter enough to set off the other richness present. 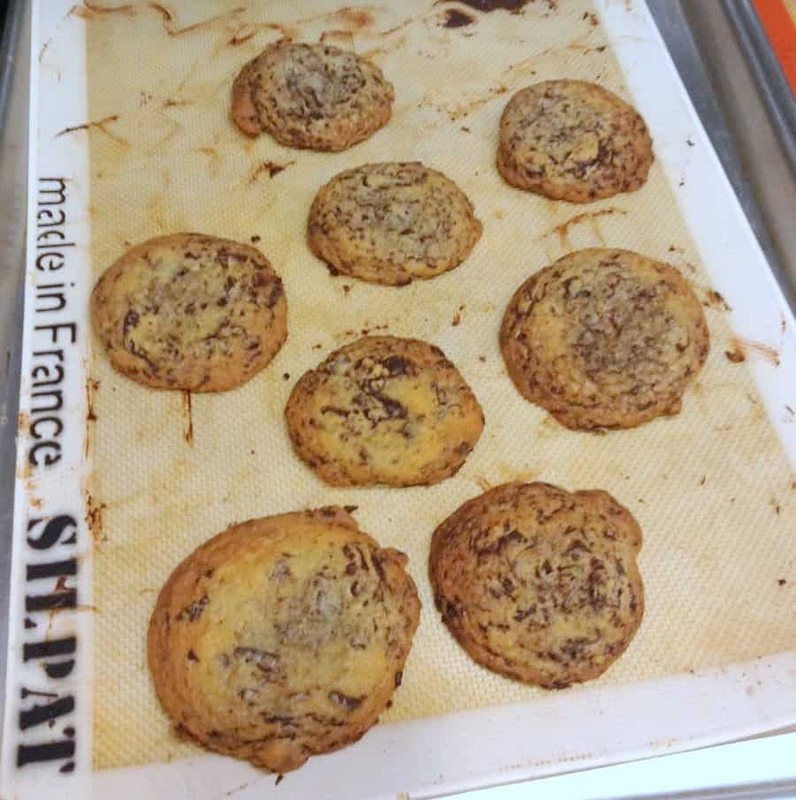 They were hard to stop eating fresh out of the oven, with the chocolate flowing and gooey and the light crispness to the outside of the cookie. Apparently day old cookies were also good toasted, though they were long gone before I got home to test this theory. That should tell you something. Whip half of the butter on medium speed until smooth. Add the remaining butter and sugars. Beat until light and fluffy. Add the eggs, one at a time, blending well after each egg. On low speed, mix in the dry ingredients. Fold in the chocolate. Use 1 1/2 T or 2 T dough per cookie and form into balls. Place at least two inches apart on a Silpat-lined baking sheet. Bake at 350F for 10 (for 1 ½ T) or 12 (for 2 T) minutes. Cool on the pan a few minutes before cooling on a wire rack completely.